1. 200 needle count sock. Most cushioned due to this high thread count. 2. Hand-linked toe seam. Smooth and flat ON TOP of the toes (as opposed to on the toes) to help prevent blistering. This is done by hand is one of the key reasons why they are able to Balega is able to employ so many people in south Africa. 3. Vent mesh panels. Help with fit, ventilation, and moisture management. 4. Deep heel pocket. Long seam creates a deep pocket to secure the heel. 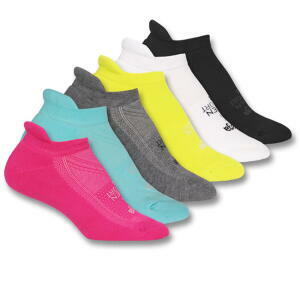 More durable as this helps prevent movement in the sock (no slippage or shifting in the heel). 5. Comfort Bib Top. Comfort band around the top of the ankle that stretches. Due to the heel keeping the sock in place, they do not need to tight band to keep the sock up! 6. Heel Tab. Cushions the Achilles tendon and one more way to prevent the sock from slipping down into the shoe.